Julian is a small mountain community in Southern California located at the intersection of California highways 78 and 79, about 50 miles northeast of San Diego. This historic gold-mining town is nestled among oak and pine forests between the north end of the Cuyamaca Range and the south slope of Volcan Mountain. The entire township of Julian is a Designated Historical District. Its image as an early California frontier town with pioneer store fronts, historic sites and guided tours of Eagle and High Peak Mines accounts for much of its modern appeal. Tourism is Julian's largest industry, followed by cattle raising. Julian is also unique among Southern California communities for its cold-winter climate, ideal for growing apples. All Julian apples are sold locally as apple pies, apple cider or whole fruit. In October, 10,000 apple pies a week are baked in Julian, when Southern California tourists flock here for the fall colors, cool breezes, frontier atmosphere and its famous Apple Festival. 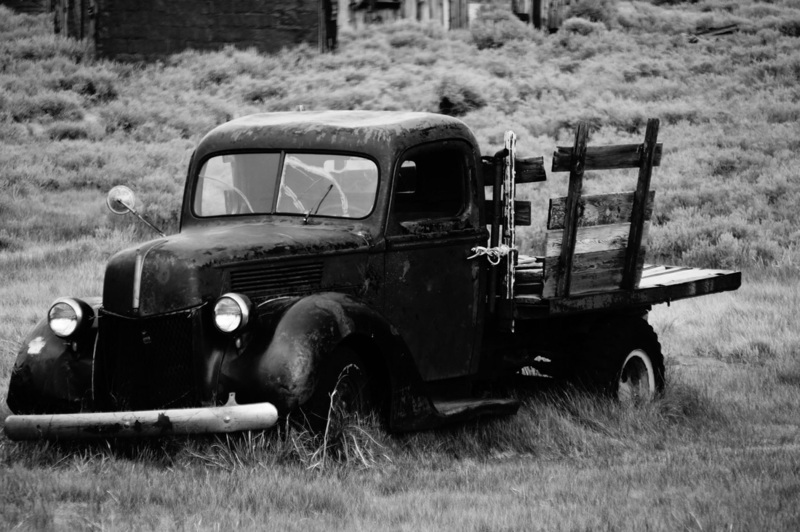 Julian began as a California mining camp when A.E. (Fred) Coleman discovered placer gold at Coleman Creek in 1869. 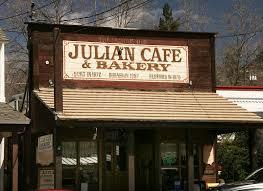 Drue Bailey founded Julian City in 1870, naming it after his cousin Mike Julian. Bailey and Julian were cousins and ex-confederate soldiers who had left Georgia after the Civil War for the California gold fields. 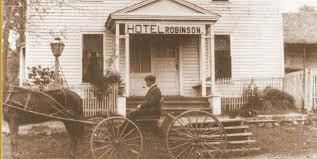 By the summer of 1872, there were 50 houses, 3 hotels, 4 stores, 2 restaurants, 1 schoolhouse and the "usual number of saloons" to service an an estimated 300 miners working in the area. Numerous hard rock mines were established in 1879 in the Julian and Banner area yielded an estimated $4 to $5 million dollars in gold ore. Unlike other such camps, Julian survived after the mines played out because of its climate, rich soil and proximity to San Diego. Julian's first newspaper, The Julian Sentinel, began publishing in 1887. Since James Madison first brought the first apple trees to Julian in the early 1870s, Julian apples have won many blue ribbons at places like the Chicago World's Fair of 1893, the St. Louis Fair and the San Francisco World's Fair of 1915. The first Julian apple celebration was held in 1909 , but wasn't followed by another until 1949.